I don’t write fanfiction, but I think it’s a great thing. It’s got to make the process of writing easier to start because you already know the characters and their world. Presumably, you’re really into them. Fanfic can be inspired by books, TV, movies, games. Image: Lucélia Ribeiro. CC BY-SA 2.0. The really awesome thing about fanfic is that it helps kids to become producers, not only consumers of texts. Christina Olin-Scheller and Patrik Wikstrom use Toffler’s term ‘prosumer’ to highlight the importance of fans’ participation with the text. Katie Behrens emphasises that fanfic needs to be transformative rather than derivative and therefore contain substantial original material. Yet fanfic etiquette requires writers stay within the canon i.e. the world of the text created by the author. In the primary school context this might be less rigidly enforced, particularly for reluctant writers. But, remaining within the canon could enable teachers to gauge students’ comprehension of the text, particularly character traits. Image: Carissa Rogers. CC BY 2.0. When students are inspired by a text to write fanfic, there is potential for them to become involved in a community of similarly inspired writers, or an affinity space. An authentic fanfic community provides members with the feeling that their writing matters to someone. Group members share and receive feedback on their work. To nourish such a community within a classroom/school the teacher can encourage several groups of students to write fanfic based on texts that are relevant to them. 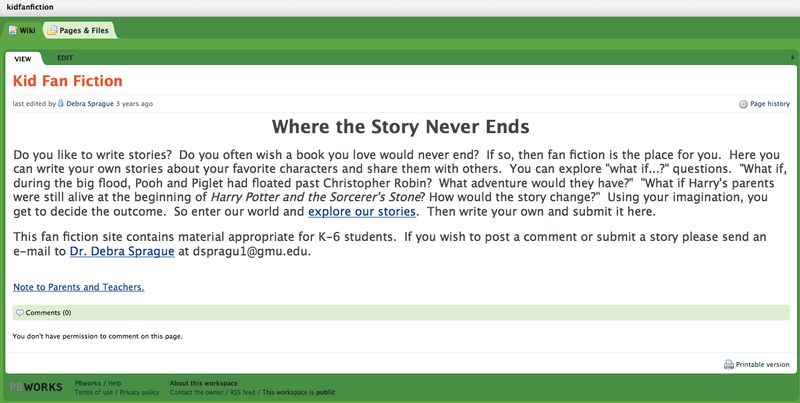 Debra Sprague has created a wonderful forum for primary school students to share and receive feedback on their fanfic. Where the Story Never Ends is a purposefully created site for primary school writers. Alternatively, students could upload their fanfic to school based websites. Survey results suggest my Year 3 students could be inspired to write fanfic by Andy Griffiths’ and Terry Denton’s The Treehouse books. I know most of them have read these books. Some of them were in my Year 2 class last year and I read them The 13-Storey Treehouse and took them to a theatre adaptation of it. The boys especially loved drawing their own treehouse designs; they would create group drawings that required up to 12 pieces of A4 paper taped together. This was a wonderfully collaborative experience for them. How to start writing after reading any of these books with the class? Students could collaborate to produce group drawings and discuss possible story lines as they draw. The exchange of language and ideas can propel students to write individual or shared fanfic. A fantastic idea from Debra Sprague is to provide students with fanfic mentor texts written by the teacher (or other teachers or older students). Simple innovation on a text, a common classroom writing strategy, can be the beginnings of fanfic. Students could also create cartoon strip fanfic using Comic Creation Apps. 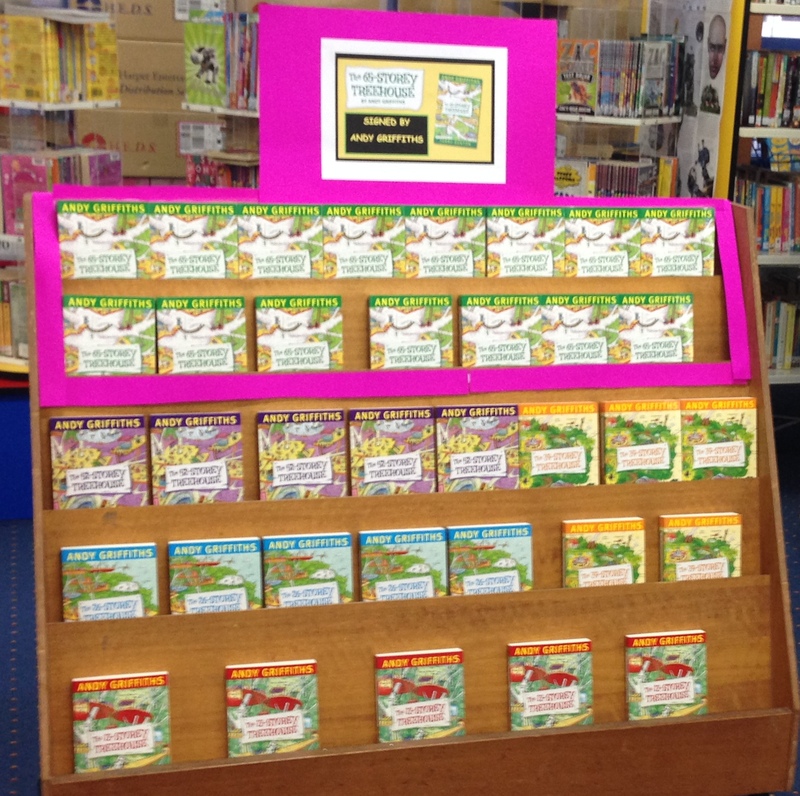 Book Fair Treehouse books display. These books sold like hotcakes and have potential to inspire readers to write fanfic. 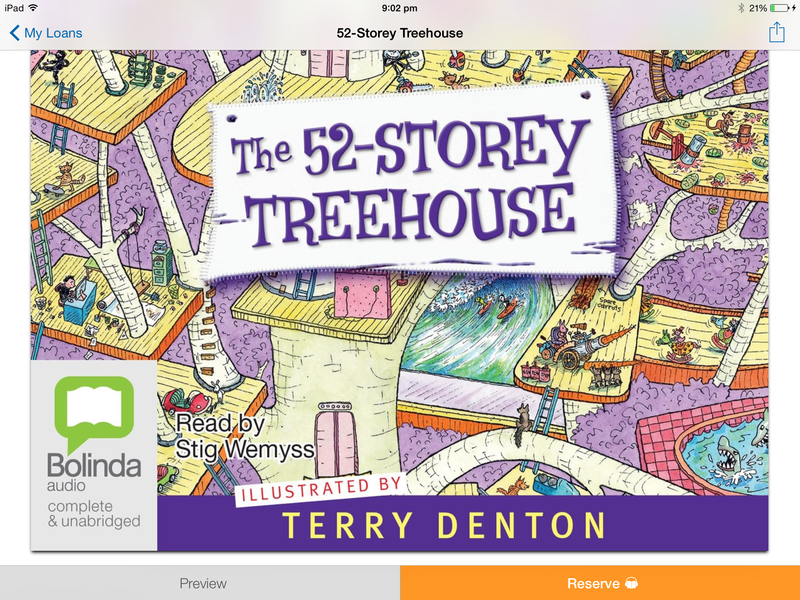 I’ve looked at how The Treehouse books could be a perfect fit for many of my Year 3 students. What texts (books, games, TV shows, movies) can you see inspiring fanfic with students? I’d love to hear your ideas. Hi Helen I really enjoyed this post as I would love to see fan fiction used more in the primary school setting. I think it provides students with an opportunity to engage in a meaningful way with books that they are interested in. It also provides them with opportunities to engage with other like minded individuals across a variety of platforms. I think you have really wonderful ideas in this post that I would like to try in the library. I’m new to the library role and wasn’t aware of the website Where the Story Never Ends created by Debra Sprague. Suggestions for being able to incorporate apps such as Comic Life is another great way to spark students interest and incorporate technology. Thank you for sharing such wonderful ideas and sites I haven’t heard of. I look forward to trying something similar in the library. Thanks Laris6. I hope Where the Story Never Ends proves to be a useful site for you in the library. I would be very keen to hear about your use of fanfiction with your students. Keep me posted! HI Helen, thanks for sharing your ideas on fanfic, not something I’ve had a lot of experience with in the secondary classroom where texts are often centrally set and assessed. Because of the lock-step nature of the way say, English is taught in secondary school, the real interest and engagement students have with fanfic is mostly done outside-of-school, ironic as that may sound. I would love to see more flexible arrangements in secondary where students could gather in fanfic groupings and do all their learning through a shared, collaborative engagement with texts they choose and enjoy. 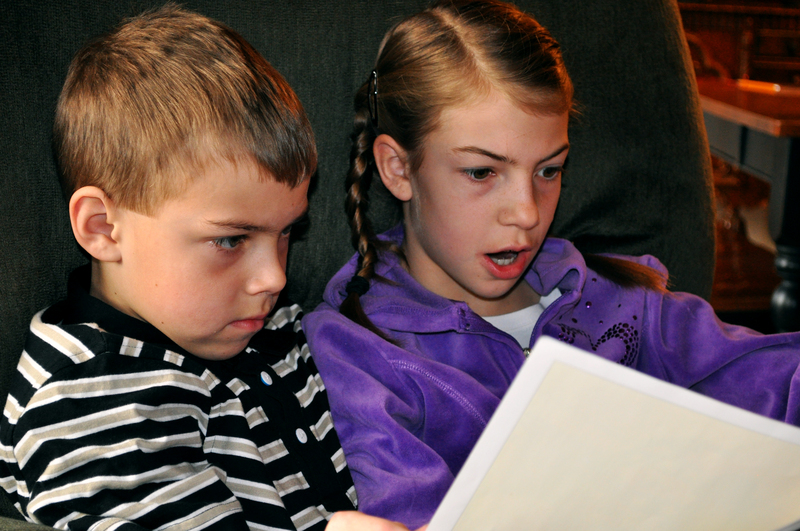 Reluctant readers could congregate around a graphic novel, comic series or manga collection for instance. Fanfic groupings are a further example of how participatory culture can develop, with students discussing, sharing, comparing and ultimately, creating their own texts. The interest and motivation to engage are in-built. A class blog in which groups share their texts and their critical and creative responses, has great potential in terms of providing students with a collaborative learning environment with all the possibilities it offers for students to write for a real-world audience of peers and others. There are so many possibilities for students to engage and create through fanfic. Hi Luke. I hadn’t appreciated the freedom primary teachers have to choose texts to meet curriculum requirements. Fanfiction is a really new concept to me but I’m very excited by it and can see it benefiting all my students from reluctant readers/writers to those who have already taken flight.